Before we delve into fall foliage, Leslie Van Berkum of Van Berkum Nursery sent me her answer for yesterday’s trick true or false question - The chainsaw cutting tooth design was inspired by beavers. Way to go, Leslie. Extra points! 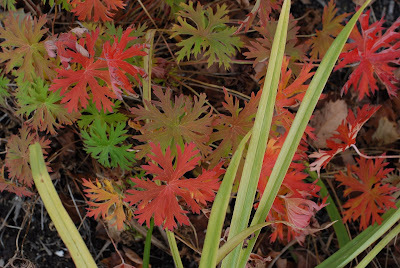 Now, let’s check out one or two perennials often overlooked for fall color. A favorite in the garden is Geranium ‘Nimbus’. 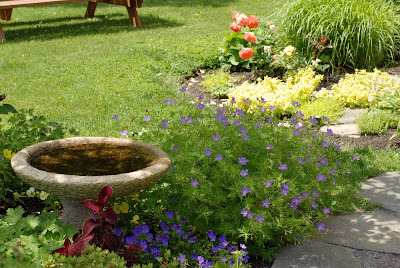 This perennial geranium has a fine-textured leaf with soft lavender blossoms from late-spring to mid-summer. Its stunning fall foliage rivals the color of most sugar maples. Great to plant in masses as an edger or as a specimen by itself, Geranium ‘Nimbus’ is a must-have for any garden. 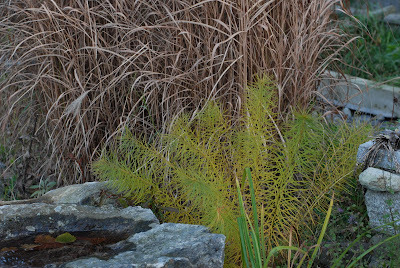 Another great perennial sporting fantastic foliage is Amsonia hubrichtii. In early summer, this versatile plant displays delicate blue star-shaped flowers and soft, feathery foliage. This phenomenal plant-lover’s plant continues to put on a show late into the season with its yellow and soft orange hues. Both of these perennials are sun-lovers and can be layered in nicely to your border. We end with our inspirational thought for Wednesday by Joseph Joubert. “It is better to stir up a question without deciding it, than to decide it without stirring it up.” I still think beavers might have something to do with the chainsaw invention. Happy Birthday, David.